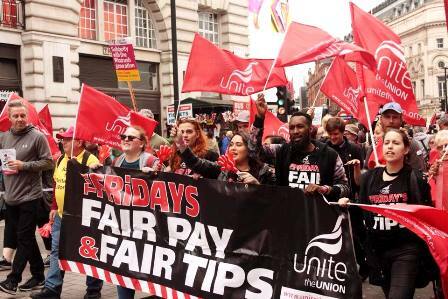 Workers at two UK restaurants of the US franchise chain TGI Friday's struck for 24 hours on May 18 after being given two days' notice that they would be stripped of 40% of their income from tips - a loss of up to GBP 250 per month. Workers at two other TGI Friday's locations have voted 100% in favor of possible strike action on June 25, with other locations set to follow. As the strikes commenced on May 18, The IUF-affiliated Unite held lunchtime rallies at the restaurants to support the strikers before moving on to a mass low-pay rally in Central London including McDonald's workers. You can support the fight back against exploitation and low pay - CLICK HERE to send a message to CEO Karen Forrester, telling the company you support the workers' demands and urging talks with Unite.